Is Usage-Based Auto Insurance The Gas Tax You’ve Been Waiting For? Why do people eat so much at buffets? Once they’ve paid to enter, there’s no cost to eating as much as they can – aside from, well, feeling tired and sick. Owning a car is like buying a 24-hour pass to a Vegas buffet. Every single day. We drive so much because once we’ve shelled out to have a car, the cost to drive each extra mile is minuscule. While the average cost per mile is nearly 60¢, according to the IRS and AAA, the cost to drive just one more mile, a.k.a. the marginal cost, is just the cost of fuel. That’s 11-13¢ a mile at current rates, assuming a 25-30 mpg car, and the $3.32 per gallon gasoline (the CA average as of February 28,2015, per AAA). The fuel cost is about 20% of the total cost of owning a car, on a per-mile basis. For a single extra trip under 13 miles, true for most trips and most commutes, driving is potentially cheaper than taking the bus. The more people feel the cost each time they drive, the less they will drive like they eat at a buffet. You might be willing to pay $1 for that first brownie, but not for the eighth one… unless that eighth one is “free.” Suddenly, some car trips that made sense when they cost 10¢ a mile, don’t make sense when they cost 15¢ or 30¢ a mile. Artificially cheap or free parking has an integral role here – parking guru Donald Shoup estimated that employer parking subsidies amounted to 27¢ a mile on average for commuters in 1997. If employer parking subsidies went up at the same rate as inflation, that’s 39¢ per mile in 2015 dollars – that’s triple fuel costs for a 25 mpg car – and twenty times the current U.S. average gas tax of 48¢ per gallon, ~2¢ per mile. The more the share of the cost of driving can be felt each time people drive, the less driving people will do. Gas taxes are effective, but incredibly unpopular. But now, there is another tool that would have a similar impact, without increasing the cost of driving per se – usage-based insurance. The more you drive, all else equal, the more likely you are to get into an accident, and thus the costlier you are to insure. Traditional insurance gives discounts for driving fewer miles, but those discounts are modest, probably because the mileage figures that people report are unreliable. The new usage-based insurance policies charge you based on how many miles you drive, using a device that plugs into your vehicle’s diagnostics port to count the miles driven. A usage-based policy effectively converts part of the fixed cost of having a car to a variable one. In other words, it functions like a gas tax. And a usage-based policy lets an insurer pick off those low-mileage customers that are the cheapest to insure, by giving them a lower price than a non-usage-based policy. With enough time and popularity, that could mean auto insurance gets pricier for people who drive a lot, as they’re the only people left on buffet-style policies, and are thus more prone to getting into accidents and are pricier to insure. This process is known as adverse selection. In fact, “The number of consumers who actually purchased a UBI [usage-based insurance] policy has nearly doubled in the last year and a half,” according to market research firm Towers Watson. Under the current paradigm, people who drive less subsidize the insurance of people who drive more, just as the abstemious subsidize the voracious at buffets. I signed up for one such policy recently – Metromile, currently the first and only usage-based policy in California. If you drive less than 10,000 miles a year, it claims, you stand to save money by switching. I did a little comparison shopping, and the math checked out – a usage-based policy really was the cheapest option for a lower mileage driver like me. Full disclosure: I have had a Metromile policy for my car since December 2014. Some usage-based policies take into account how and when you drive (e.g. how hard you brake, driving at 3 a.m.), but Metromile does not. Metromile has a base rate of $1-2 per day ($1 for me), regardless of miles driven. My rate per mile is about a third as much my gas expense (4.5 cents vs 15 cents per mile) – but my car is cheap, with mediocre fuel economy and my policy lacks collision coverage. With a pricey, fuel-efficient car with more coverage, the per-mile insurance rate could approach one’s gas cost. A Metromile representative stated that for California, “pricing is built with a base rate of $30 to $60 per month and 3 to 6 cents for every mile driven.” At the current average California price of gasoline of $3.32 per gallon, with a hypothetical fuel economy of 25 miles per gallon, a Metromile policy equates to an additional gas tax of 75-150¢ per gallon – an increase in the cost of driving another mile by about a third. One flaw with the current Metromile policy pricing is the high base rate – a customer who drives zero miles must still pay $365-730. That means that the more you drive, the lower your total insurance cost per mile, because the policyholder is spreading the base rate charge over more miles. A “pure” usage-based policy would charge users closer to nothing for having the policy, and a higher per mile rate. To be sure, there are some costs of insuring a car, even if that car never moves. 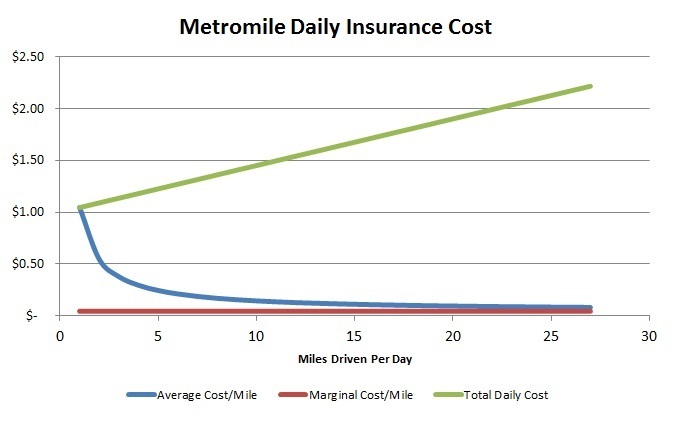 The graphic below shows the average, marginal, and total cost of a Metromile insurance policy with a base rate of $1 per day, plus $0.045/mile, depending on how many miles someone drives per day. 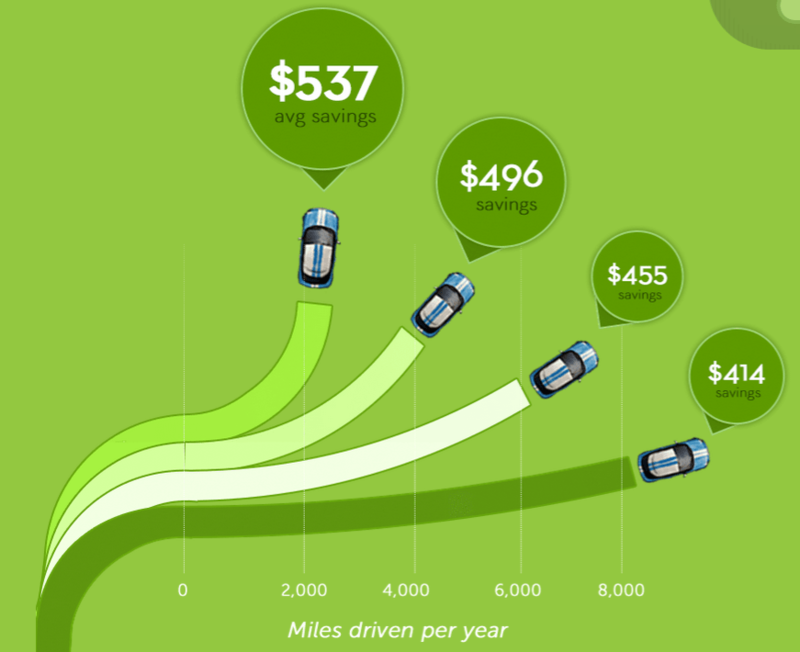 The more miles one drives, the lower one’s average insurance cost per mile. If you’re driving more than 27 miles per day on average, Metromile ceases to be competitive on price with prevailing non-usage based policies. A “purer” policy, of charging say, $0.12 a mile (which is roughly the cost of gas for a car of 25-30 MPG fuel economy) with a small base rate instead would make the policyholder even more anxious to drive less. Hopefully, as more insurers create similar offerings, policies with lower base rates and higher per-mile rates will become available. Usage-based policies offer the behavior-changing benefits of a very large gas tax, without technically making driving pricier, or eliciting implacable political opposition. The insurance savings are still modest compared to the total cost of owning a car, which averages about $9,000 a year, so few people that are currently car-free will suddenly get a car thanks to cheaper usage-based policies. In the future, insurers might integrate the mileage recorder with peer-to-peer carsharing platforms, such that you don’t pay for insurance when someone else has rented out your car that you rarely use. Usage-based policies are no panacea. Car ownership is still vastly subsidized by numerous government policies – a state of affairs to which principled progressives, conservatives, and libertarians all rightfully object. So drivers still don’t cover the true cost of driving. But usage-based insurance offers promise as a solution that doesn’t depend on changing entrenched government policy to get people to drive less. A usage-based policy would be a great fit for the elderly, for instance, who drive less. A usage-based policy would reward them for walking instead of driving, which has immense health benefits at their age. These policies are also increasingly paired with mobile apps that share how much you drive – just as people are seeking to link their car with their smartphone. A Towers Watson survey revealed that “78% of smartphone owners want an app that automatically records trips.” With a little social media integration, we might have people competing with each other to see who can drive less. In the future, people may weigh not only the cost of gas when deciding whether to drive, but also the cost of their insurance. Asher Meyers is an L.A. native and resident. Meyers works as a cost estimator in the aerospace industry. He studied economics as an undergraduate, and has a new-found interest in the aesthetics and economics of cities. Meyers is a Metromile customer, but otherwise has no tie to them, or any other insurer. And depreciation, and maintenance, and maybe parking. Cars depreciate both on duration and mileage. The average cost per mile of depreciation is not significant and not visible, except when it’s time to purchase a new car. And with depreciation tapering off for older cars, the added marginal cost for a mile on my 11 year old Acura is much less than it might be on a 2 year old BMW. It is much more visible for lessees, where each additional mile on a lease might cost 20-25 cents a mile. Still, leases have 10,000 to 15,000 miles per year so if you drive less than that you essentially are giving that away. Similar, oil needs to be changed at mileage and/or duration. If you have to change your oil every 12 months or 10,000 miles (as is the case on many modern cars) then if you drive less than 10,000 miles that year, you would have to change it anyway. The only part on a car that is not both duration and mileage based might be tires. 15,000 miles is an average of $3,571 of depreciation according to the AAA. This comes to 23.8 cents per mile. Thank you calwatch, you said it as well as I could have. Just as important as the mileage effect, as you put it, is the visibility. If people don’t concretely link the cost and making a trip, the cost won’t serve as much deterrent to driving more. It would be interesting to see a lease that charged per mile for the first 10,000 miles as well (plus a base rate, because even a car with zero miles depreciates). It could be something like a base rate of $1,000 per year, plus fourteen cents a mile, amounting to $200 a month for a 10k mile per year driver. Thanks for clipping off the last part of the sentence. One can go to Edmunds and calculate the delta cost per mile, or use a KBB or NADA guide adjustment per mile. For example, for a 2005 Honda Civic with 100,000 miles compared to 150,000 miles, the difference in value is $750, or 1.5 cents a mile. Pretty negligible if you keep cars for a long period of time. Newer cars obviously have more of a cost per mile: the same Civic, but a 2010 model, with 50,000 miles compared to 75,000 miles has a difference of $850, or 3.4 cents a mile. Still, most of the depreciation of the car is based on time held – in those five years, the car depreciated $5,000, regardless of whether you drove it zero miles or 100,000 miles. So if you have an older car and you put few miles on it, the cost per mile of depreciation is not significant. That’s a little bit different than saying simply “The average cost per mile of depreciation is not significant” with no qualifiers. The fact that we’re arguing over intricacies like depreciation rates for old cars just proves the point about visibility. If people don’t know how much their choice is costing them, they just throw up their hands and defer to the status quo, which is driving. When you use a carshare like Zipcar, you know exactly how much the car will cost, and can intelligently weigh it against competing options. I’m sure there exist people that limit driving to save on depreciation, but I’ve never met anyone who did. People *do* pay attention, however, when they hit those lease mileage limits, because it’s very clear. Also, the average age of cars on the road is 11.4 years. Many people are driving their car until it dies, so depreciation is not much of a concern. They are not sitting around calculating depreciation on their 2003 Honda Civic to decide whether to drive 3 miles to work or not. I’m the article author, and wrote the guest comment above. Wonderful information. Thanks for providing us such a useful information. It’s providing many helpful information for me.Your article keeps useful information about Usage-Based auto insurance.Very informative site.Thanks for sharing.